These Cheesy Potatoes are total comfort food! 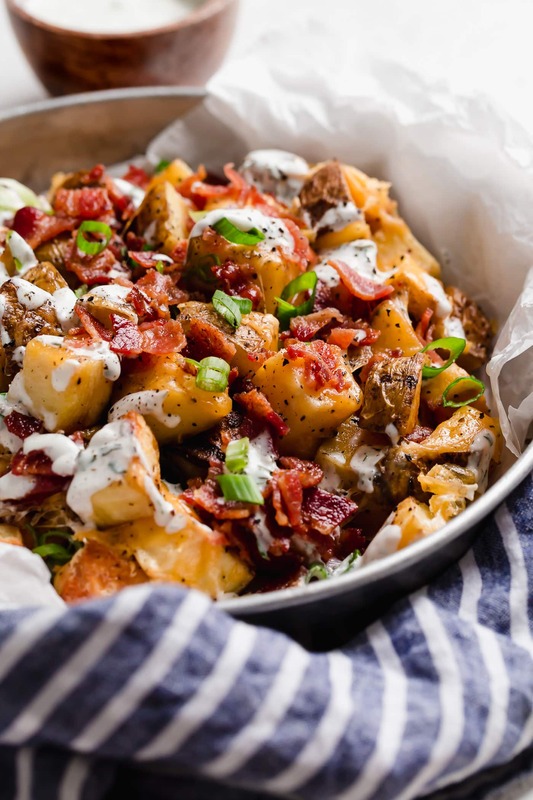 You get perfectly roasted, bite size potatoes covered with gooey melted cheddar, and they’re finished with crisp bacon, homemade creamy ranch and fresh green onions. Simply put these are 100% irresistible! 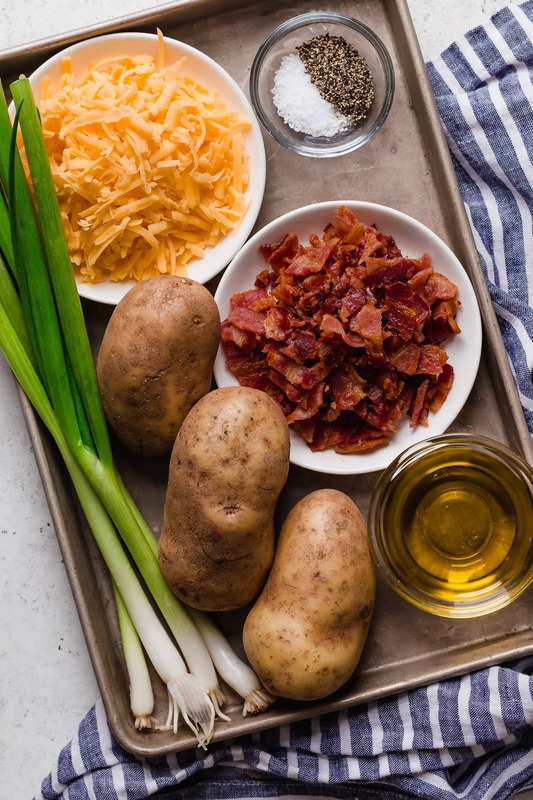 Cheesy Potatoes Recipe with the Works! 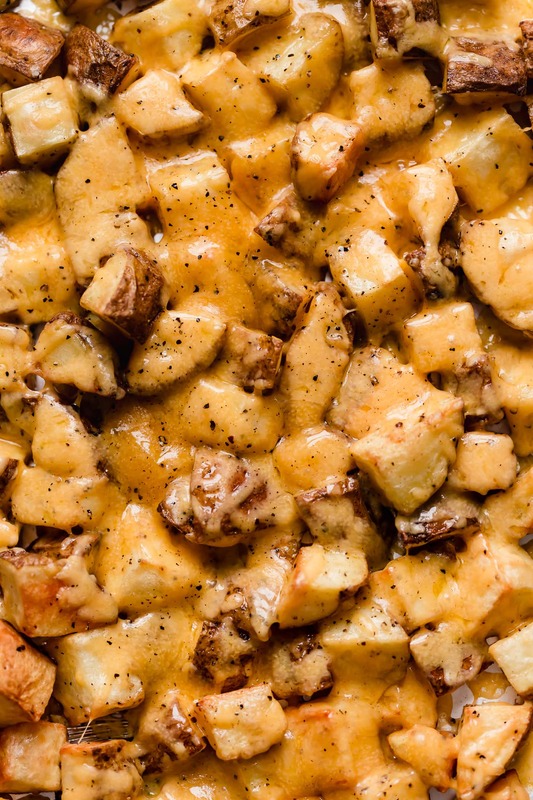 These Cheesy Potatoes are one of the ultimate comfort foods! Everyone in the family will go crazy for them. 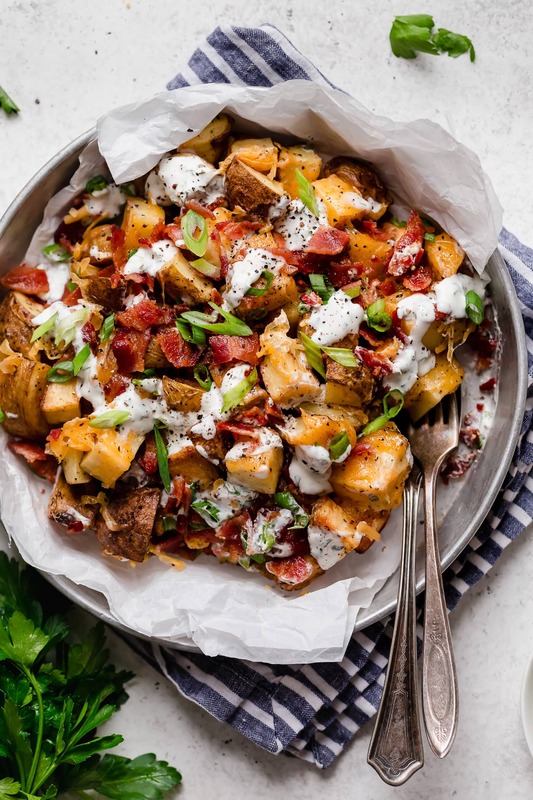 Talk about best way to turn a bland and boring potato into something seriously delicious! If you’ve ever ordered the cheese fries at a steakhouse then these will taste very familiar to you. I opted to use a lighter ranch dressing here but they’ll also be delicious with a traditional ranch. And if you really want to splurge add in some extra bacon! 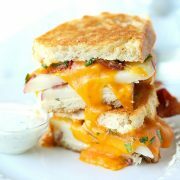 Aren’t you just drooling thinking about these things? They’ll be a the best addition to your dinner menu, trust me. It will be like wait what main dish? I’ll just take more potatoes, thanks. What Ingredients are Needed for Cheesy Potatoes? Bacon – regular cut bacon is what I use here but if thick cut is what you have feel free to use that. Diced Russet Potatoes – stick with russets for the perfect texture. Olive oil – another neutral flavored oil will work here such as canola oil. Cheddar cheese -I prefer medium or sharp. Low fat will work great too. Ranch – this is a key ingredient. Don’t omit the ranch! Green onions – parsley will work too if that’s what you already have on hand. Preheat oven to 400 degrees and grease a baking sheet. In a bowl toss potatoes with olive oil, salt and pepper. Spread onto prepared baking dish. Bake in preheated oven until tender, about 55 minutes tossing three times throughout baking. Sprinkle with cheese and bake until melted. 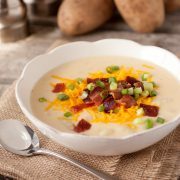 Drizzle with ranch dressing, top with bacon and green onions. Want to Make Quick and Easy Cheesy Potatoes? Use store-bought ranch and pre-shredded cheddar cheese for a few quick shortcuts. You can also use leftover bacon (if that exists at your house, it disappears in seconds at mine). The other great time saver here is that you don’t even need to peel the potatoes (you know that dread kitchen task we all hate). Just be sure to scrub and rinse them clean before chopping. 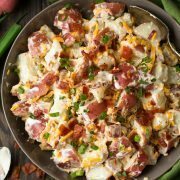 More Delicious Potato Recipes to Try! These potatoes are total comfort food! 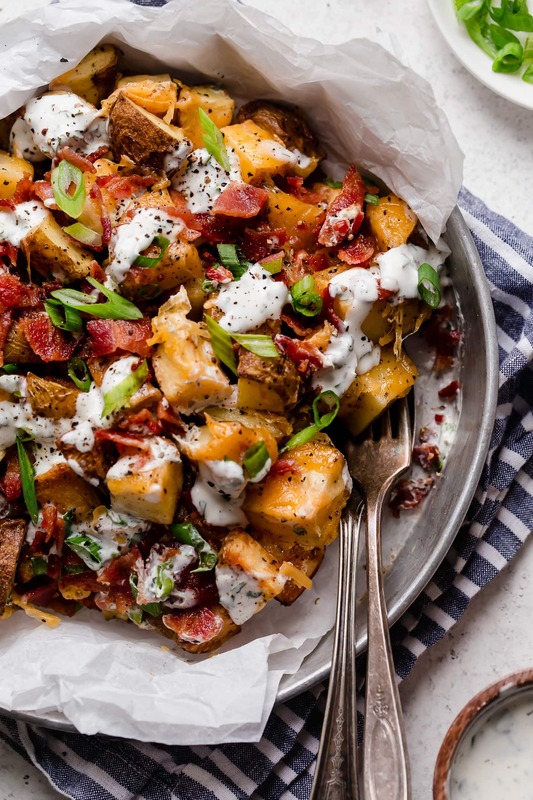 You get bite size potato portions covered with melty cheddar and they're finished with crisp bacon, creamy ranch and fresh green onions. Who could resist? Preheat oven to 400 degrees. Spray a rimmed baking sheet with non-stick cooking spray. In a large mixing bowl toss potatoes with olive oil, salt and pepper. Spread onto prepared baking dish. Bake in preheated oven 20 minutes, then remove from oven and toss*. Return to oven bake 20 minutes longer, remove and toss. Return to oven and bake until golden and edges are crisp, about 15 minutes longer. Move potatoes closer to center so there isn't lots of extra space between them, sprinkle evenly with cheddar then return to oven and bake several minutes longer just until cheese has melted. Remove from oven and drizzle with ranch dressing, top with bacon and green onions. Serve immediately. For the light ranch dressing: In a mixing bowl stir together 1 (5.3 oz) container plain Greek yogurt, 2 Tbsp full fat mayo, 2 Tbsp milk, 1 tsp lemon juice, 1 1/2 tsp dried parsley, 1/4 tsp dried dill, 1/4 tsp onion powder, 1/8 tsp garlic powder, S & P to taste. Or try with my traditional ranch recipe HERE. *A thin metal spatula works best to flip so you can break the few potatoes that stick away from pan.